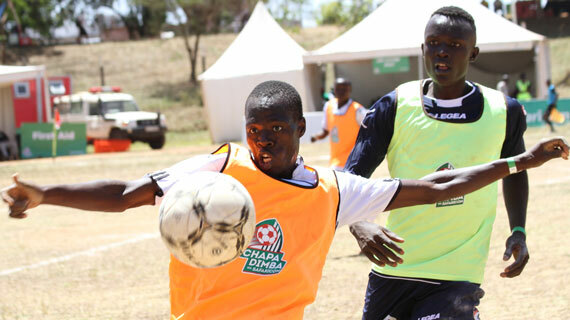 The first of eight Chapa Dimba Na Safaricom regional finals will take place this weekend at Bukhungu Stadium, Kakamega County. The winners will get a chance to represent Western region at the national finals set for June 2019 in Meru. A team of certified LaLiga coaches will also be on hand to scout for talented boys and girls who will make up an all-star team. Regional defending champions in the girls’ category Bishop Njenga from Lugari will take on Brenda Girls from Bungoma while Kigandole from Busia will face Ibinzo Girls from Kakamega. In the Boys semifinals Vihiga’s Ebbu Stars play The Saints from Butere-Mumias while Lugari Blue Saints will play Bukembe Friends from Bungoma. “We are happy to have reached this far in the second season of the tournament. The boys and girls have got amazing talent and Chapa Dimba Na Safaricom provides the right platform to propel them to national glory. So far, over fifteen young players have joined the Kenya Premier League and the National Super League from the inaugural season. We will have scouts from LaLiga in all the regional finals and we will be on the lookout for the best players to form the All-star team that will fly to Spain to train with local La Liga sides”, said Nick Mwendwa, Football Kenya Federation President. The winning teams from Sunday’s final will each receive a cash reward of KES 200,000 and proceed to the national finals for the grand finale where the winning boys’ and girls’ teams will each walk away with KES 1 million shillings in prize money. After Kakamega, the competition move to Moi Stadium in Kisumu for the Nyanza final on 9th and 10th February 2019. The competition will then move to Rift Valley, Eastern, Coast, Central, North Eastern and Nairobi regions as the race to La Liga heats up. The competition aims at scouting for youth talent, developing grassroots football, and ultimately propel gifted players to the national team.